I'm a Christian and I absolutely love Christmas time! I love the fact that there is a great deal of traditional music associated with this period of time. I must admit I get sentimental when I see the lights start going up too. Yes, I loved the lights, the decorations, the trees, the carols, and the whole whoop-de-doo of Christmas, with my whole young heart. Since leaving school the number of Christmas cards hanging up has declined year after year. For me now Christmas cards mean a lot as they are usually sent and received to and from those who mean a lot to me and who have managed to remain in contact either in person from time to time or via email/post. So despite the number of cards dropping into the post box, I treasure the ones I receive. I went about surfing ChristmasCards.uk.com and was amazed at the varied specific Christmas cards available, such as recycled Christmas cards, photo Christmas cards, corporate Christmas cards and charity Christmas cards. I chose photo Christmas cards that caught my attention! It's so simple and it's fun to create when there is no limit or restrictions on what you are allowed to do with your greeting card. Just upload your photos, choose from a wide range of borders and photo clip art, compose your wording and see the results straight away. These Christmas cards are very popular for those who use the season as the best time to update family members and friends living far away with their most recent photos. It becomes a good remembrance item as well and gives the Christmas card a more intimate feel. Go check it out and start making your photo christmas cards! Aiyo I couldn comment la just now! LOL yeah lor… I have a new job hafta translate an entire website!! But booo to more work sigh…. halloe Pretty Monica!!! how are we today.. me just got home lah.. busy day! haha Foong! Merry Christmas to you too :-D :-D start counting down mah LOL!! Don't we just love customised things? I think majority people do. Hi Monica, thats a lovely pic of you. 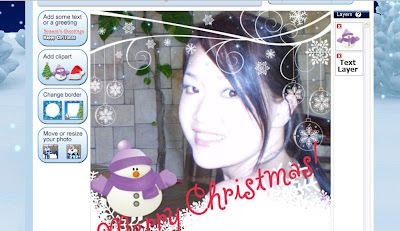 Very nice, and the kind of smile can light up ten X'mas trees, ha ha. Practically every home by Dec 1 will have decorative lights hanging around their homes, and almost every home as a live X'mas tree outside, and again hanging colourful lights on the tree. And the whole city becomes a kind of fairyland. Add the falling snow, snow on the ground, its beautiful. I love walking on snow at night, like walking on sugar icing, or diamonds as the snow glitters and sparkles at night. And then there's the X'mas shopping, Store Santa Claus everywhere. Its fun....but! The temp might be around -15'c or even -20'c!! You have fun and keep a song in your heart. Best regards, Lee. this is such a unique way to make e-cards! Owh i love the idea of receiving a festive card, i meant physical card. As if you can smell the aroma of good intention of the sender. Knowing that the sender makes some effort, thinking of you, writing and sending a card to you, is really something. Sort of a mini therapeutic life session (oho belrlebih-lebih pula penerangan incik RnR) ini. Sms, mms, digital cards have made less people sending cards to friends. Olla, i am mesmerized by that picture of you. hehe. Mariuca! sthing wrong wz WOAFS?? I just got back Mon! this is cool. i love the first picture Mon, how sweet! so you'll be using these for xmas? thanks for the buzz2 Mariuca! You’re welcome Monica! I dropped 600 edi but now soooooo lazy to drop the last 300 sigh…..